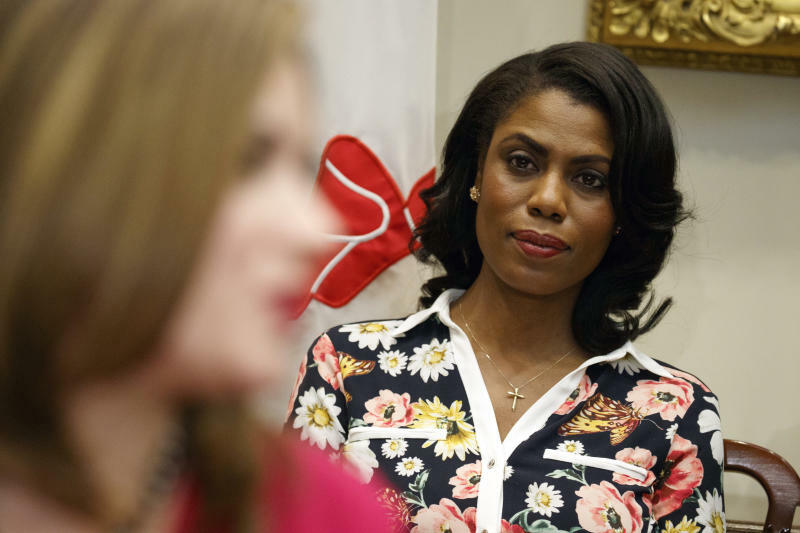 Omarosa was able to seemingly back claims of another tape when she played audio recording that appeared to be of the moment Chief of Staff John Kelly fired her from the White House. A weekly recap of the top political stories from The Globe, sent right to your email. But in her hotly anticipated new memoir "Unhinged", she never confirms she has personally heard the tape, USA Today reported. Manigault Newman explained Sunday that she'd resisted leaving the White House because "I was working to try to find someone who could take my place", noting the White House hasn't hired another African American presidential aide since her departure. "They continue to deceive this nation by how mentally declined he is". "They were not offering a real job", she said. The White House did not immediately respond to the tape, but has tried to discredit the book. Omarosa Manigault, White House Director of Communications for the Office of Public Liaison, talks with aides prior to a news conference by U.S. President Donald Trump at the White House in Washington, U.S., February 16, 2017. White nationalists held the "Unite the Right" rally in Charlottesville previous year, supposedly to protest the removal of a statue honoring a commander of the Confederate Army (the losing side in the U.S. Civil War). "And obviously I felt miserably, because after that he gets up and he says that there are good people on both sides when he should have been denouncing what we saw as clearly racist, Nazis, going against the grain of this country". White House press secretary Sarah Sanders has described it as "riddled with lies and false accusations" and accused the author of being "a disgruntled former White House employee trying to profit off these false attacks". "The chief of staff of the United States, under direction of the president of the United States, threatening me on damage to my reputation". And if I didn't have these recordings, no one in America would believe me. "So yes I recorded myself and I have no regret about it". She said that she was "totally complicit" when she defended the president after the Charlottesville riots one year ago.